The thing I love about the proper setup for the MCS Golf Swing model is that 1. It’s designed to fit the individual’s own body type and 2. When you get it right, great things happen. I’ve talked at length about leverage and the “Drop & Pop” with regards to the down swing, but in reality, it all begins with the setup. I wrote a blog posting a while back about how “rotation” is the enemy of leverage, and this addresses the upper body and trying to “rotate” in the down swing – nothing good can come from that. Most people who are steep in their down swing, who come over the top, who have an out-to-in club path at impact (and not by design), or who hit a lot of pulls, usually have something with regards to early upper body rotation contributing to their problems. With Fluffy, and in our most recent Skype session, I tried to stress to him the importance of not thinking of “rotation” or “turning” in the down swing. There is of course rotation in the down swing, but it’s not something you should be thinking about – the rotation is in the hips and will occur naturally when you are transitioning properly to the “Drop & Pop” action. When you are swinging a golf club, you are ideally supposed to go from square shoulders at address back to square shoulders (to the target line) at impact. In the below clip, Fluffy The Man wasn’t getting aggressively enough into the leading hip and I wanted to give him just a couple of things to think about on the down swing. The action of the hips with the transfer of the pressure to the leading foot produces that natural “slide and turn” of the hips, which in turn engage the Primary Lever to leverage the hands and club to the “3 O’Clock” position, which is the “Drop” in the “Drop & Pop,” and before you know it, you’re at and through impact, which of course is the “Pop” action from the “3 to 9” positions. In fact, the hardest part of the whole concept is first, to make sure you’re setting up properly with the correct bias and tilt (and of course ball position and grip), and then to conquer that impulse to “turn” through the down swing. 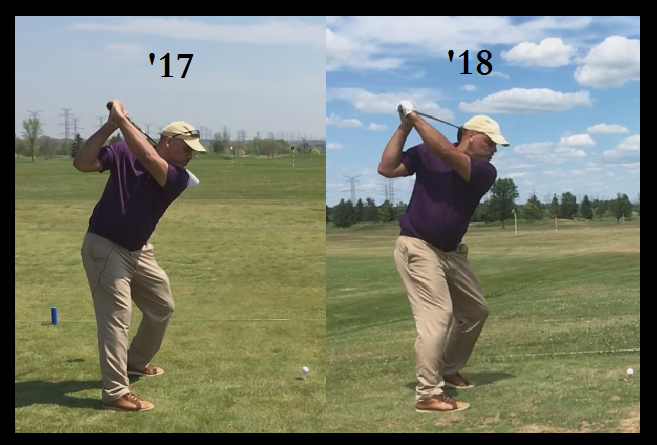 As you can see in my swing above, there is no hint of any upper body “rotation” until my shoulders get back to square at impact – the hip action and weight transfer are all that are required to get my shoulders back from a 90 degree from address, back to impact! His contention is that lack of power or being too long in the back swing is a hip turn problem. If you’re way past parallel at the top, the solution is to adjust your top position, not to restrict your hip turn! This entry was posted in Address Procedure, Drop & Pop, Leverage, MCS Golf Swing, Pivot and tagged Address Procedure, DJ Watts, Drop & Pop, Leverage, MCS Golf Swing, WAX Golf on October 23, 2018 by D Watts. 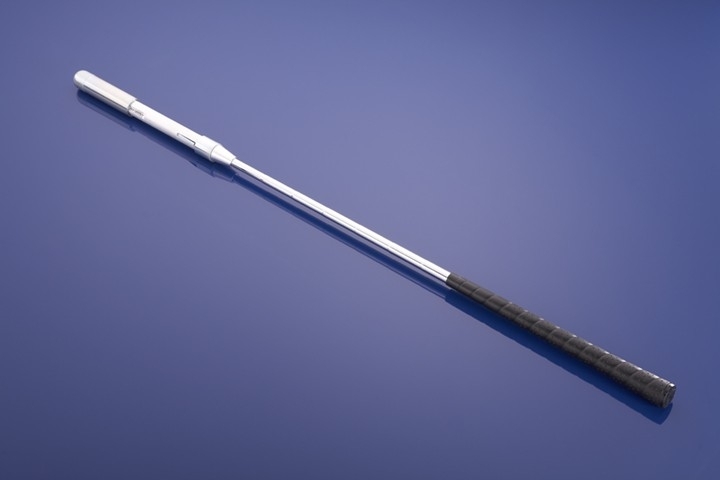 BTW, from testing I think that the more side tilt with the driver, the less spin you put on the ball = more distance. That is the result of the tilt, T.T. – if you were going to throw a ball side-arm over a high wall, would you be leaning into the throwing side and foot or tilted back to get the ball up on the release? I’ve mentioned before that I struggle with the notion of not rotating. I spent so much time trying to make the rotation happen that I’m having a hard time stopping it! I’ve been watching a lot of Bernhard Langer’s swing for some inspiration. I think he’s got the drop and pop down pat and he still puts it out there quite a ways for an older player. He might not be optimal, but his impact looks great and he never looks like he’ stressing himself. Hoping to hit the range this weekend and work on it a little more. I spent so much time trying to make the rotation happen that I’m having a hard time stopping it! I hear you, D.L.! The “turn” impulse is very hard to suppress once you’ve got used to it. 2. Once you’re in the proper position, that initial back pivot is essential. You can always make adjustments or compensations to try to “drop” into the slot, but the proper top position will allow you to make that weight and pressure shift to just drop into the down swing without having to manipulate the club or hands.